We are so proud of Andres Arcila Vasquez, a PhD student in our department, who has won the OGS for International Students, as well as the President's Graduate Scholarship that goes with it. This is a highly competitive scholarship as only 2 to 4 candidates from the faculty of Arts are put forward for the OGS competition. It speaks highly of Andres accomplishments as an economics student that he is able to get these scholarships. Congratulations, Andres! The Arts Young Alumni Award recognizes alumni who have made outstanding contributions in their professional field, in the community, and in public service within 10 years of graduation. This year, the recipient of this award is Mandy Tao, a graduate of the UW Economics program (2011). This Arts Young Alumni Award is another proud achievement Mandy can add to her already impressive resume. Currently serving as the Director of Strategy at Merck, Mandy has also been busy co-founding "Education Togo Switzerland", learning new languages and climbing volcanoes. Professor Joel Blit participated in a panel for the Waterloo Arts "Keeping the Human in AI" presentation that occurred at the Kitchener Public Library last week. Check out the full story on the Waterloo Arts webpage. Congratulations to Professor Roy Brouwer who was named to the new international scientific advisory committee on China’s environment. Check out the Water Institute's post on the subject. Jack Zhang, Mathematical Economics alumni ('14), and his company Greenlight Essentials use artificial intelligence to write scripts for Hollywood productions. 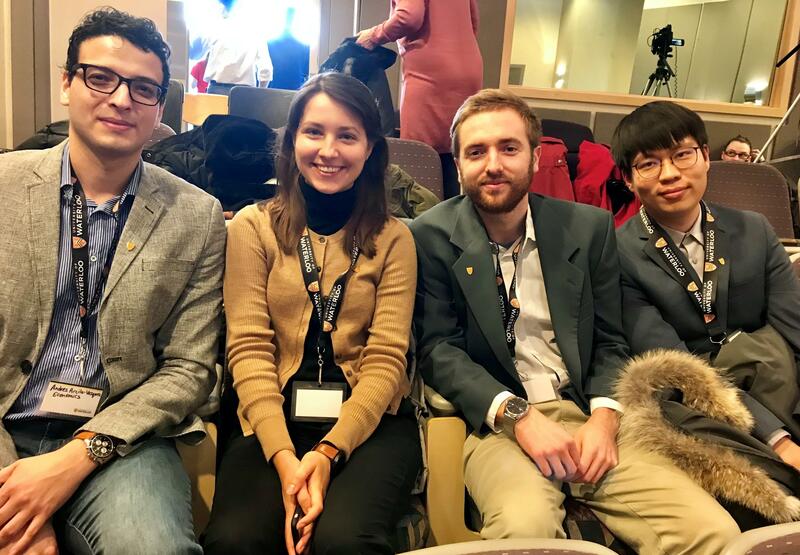 We are happy to announce that an economics team, composed by MA students Ramsha Jaweed and David Kim, has been selected to participate in the National Policy Challenge organized by CRDCN (the research data centre network created by the government to facilitate access to confidential government data). The teams submitted a proposal to analyze a policy problem of their own choosing with confidential microdata.